Has the world got you down? Are you looking to turn that frown upside down? Well why not try The Smiler, a coaster developed by the Ministry of Joy who are a secret organisation now believed to be behind all of the experiments in X-Sector. The Smiler is designed for Marmalisation; a process intended to instill a sense of social compliance through constant smiling, previously tested in a facility known as The Sanctuary. Based on the previous experiments run at The Sanctuary, the new method of Marmalisation represents a modern approach to ensuring a constant smile (with a lot less mutilation!). Known initially as SW7 (Secret Weapon 7), The Smiler was to follow in the footsteps of Nemesis, Oblivion, Rita, Th13teen and Air as Alton Towers' next big attraction. After months of speculation, a planning application was submitted to Staffordshire Moorlands District Council in December 2011, with the ride plan visuals following in January 2012. At this point there was no indication of the number of inversions, nor that it would be a record-breaker. It wasn't until May 9th 2013 that the world was finally told - The Smiler would have 14 inversions and would be a world-record holder! The ride was originally slated to be opening on May 23rd 2013, but it was announced only the day before on May 22nd that due to teething problems, the ride would not be available as planned. 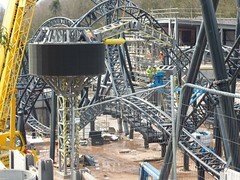 The Smiler finally opened to the public on May 31st 2013. On June 2nd 2015, four people sustained serious leg injuries after two trains on The Smiler collided. The incident occurred on the "batwing" element of the ride and involved one full train and one empty train that had stalled on the track prior to the event. The incident garnered significant media coverage, and is the worst in Alton Towers' history. Following a five day park-wide closure, which allowed the Health and Safety Executive to visit the crash site and carry out on-site testing of the ride, the park re-opened with The Smiler unavailable to all guests and with all of it's obvious branding removed. Following completion of investigations and changes made to operating procedures, The Smiler reopened on 19th March 2016. The majority of the ride's theming was restored, although some minor changes were made, including removal of the video showing comical fictitious medical effects to riders and also the removal of references to riders being 'corrected'.